This year’s repeat as your Best Home Entertainment Store is Peak Audio’s sixth gold place win in our Best of Halifax. The almost 30-year-old audio powerhouse has earned its sterling reputation by offering top-of-the-line equipment with expert-level service from its comfy Agricola Street base of operations. Having that much entertainment knowledge downtown is all the more appealing considering the home theatre market is so cornered by big-box international retailers. 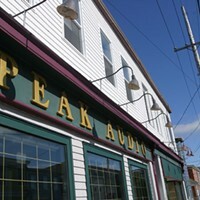 Hope to see you again next year, Peak Audio!